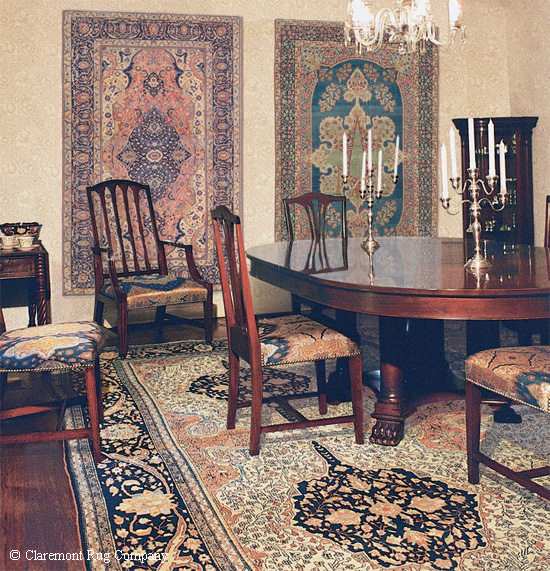 Museum-level antique Persian Ferahan (floor), Motasham Kashan and Laver Kirman carpets in formal dining room. Detail of 17th century Kirman “vase” carpet became the most expensive carpet sold at auction when it was bought for £6.2m ($9.59m). 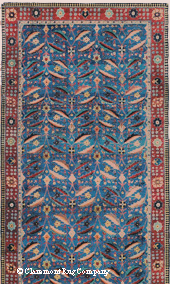 Antique “oriental” rugs have attracted enthusiasts for centuries, but it is only recently that the world’s top auction houses have shown an interest. Thirty years ago the art world largely ignored the value and significance of these works, and they were viewed by many as little more than soft furnishings. Today, however, record sale prices are forcing collectors and curators around the world to sit up and take note. 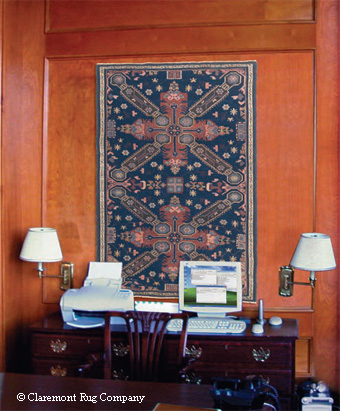 Jan David Winitz, president of the Claremont Rug Company in Oakland, California, founded his dealership in 1980. 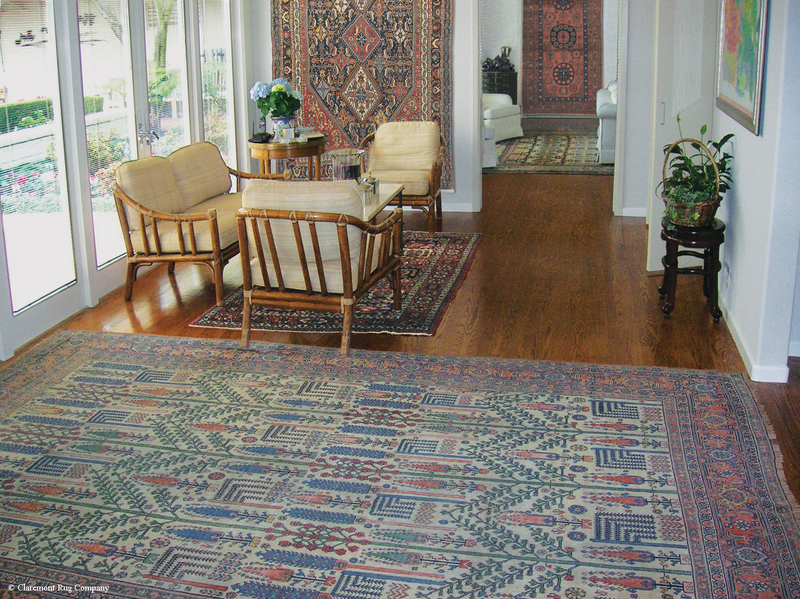 Back then the market for what he calls ‘art-level’ antique rugs was nothing like it is today: “Antique rugs were considered even by dealers as little more than a floor covering,” he says. Now, though, with the rise in price and profile, a growing number of collectors are choosing not only to lay their rugs on the floor, but are hanging them on the wall alongside paintings. Though often grouped together and described simply as “Persian”, they can actually come from Central Asia, Turkey, or the Caucasus Mountains as well as from Persia. Most date from the 19th century and comprise a variety of palettes and styles, with each town, village or tribal group producing their own distinct designs. 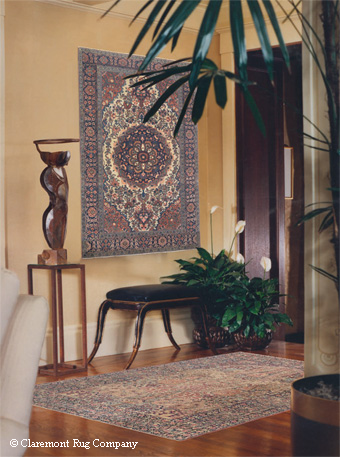 As part of their Whole Home collection, this connoisseur couple displays 19th century oriental rugs on the walls and floors. Collectible Caucasian Seichur Kuba hanging in a gentleman’s office. designer in Northwest Persia in the mid-19th century. 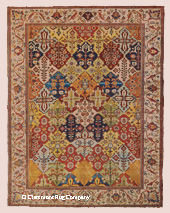 Typically, the antique rugs suitable for wall-display sold at Claremont cost between $15,000 and $150,000 each, though a number of collectors are embarking on what Winitz calls “Whole Home” projects. These large-scale installations can include up to 70 rugs per household, costing between $400,000 and $4m. Preparing a rug for wall hanging is relatively simple, but must be carried out by an expert so as not to damage the fabrics. The most traditional method is to have a series of loops sewn in at the top of the rug; brass rods are then inserted through them and secured to the wall. 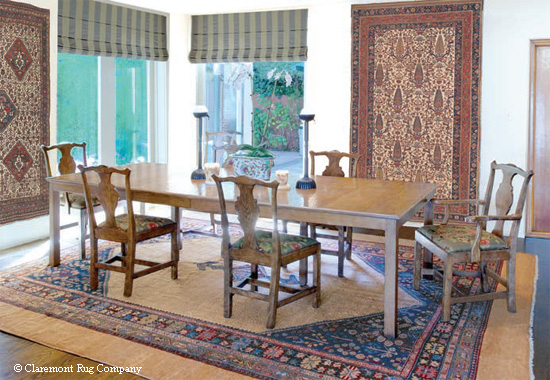 Rod King, co-founder of Antique Persian Carpets in Tonbridge in Kent, has over 42 years’ experience in the antique rugs trade. He is very much behind the trend in America as a means of preservation. “The rugs are a great investment and are really starting to sell well in the UK and in Europe but, of course, once these rugs become worn and damaged, the value decreases dramatically,” he says.